At first, I didn’t know why this bothered me so much. Clearly, the men featured deserved the honour. But so did so many others at Bletchley Park. To focus on a theme of undiscovered heroism and then lionize two men over ~12,000 others who worked there was a substantial oversight. This is only part of the reason, though; primarily, I’m disappointed because as a woman, undiscovered heroism is our thing. If we’re going to get a documentary made about us, it’ll probably be a documentary about how our work was ignored while we were alive, and then discovered in a thrift auction years later. That’s how we get our name out there. So when I see a documentary about an undiscovered man, I can’t help but feel a little cheated. Men get all the regular science documentaries! Let us at least keep the scraps. Mavis Batey cracked the Italian naval codes. Her wikipedia entry redirects to her husband’s, in true undiscovered fashion. 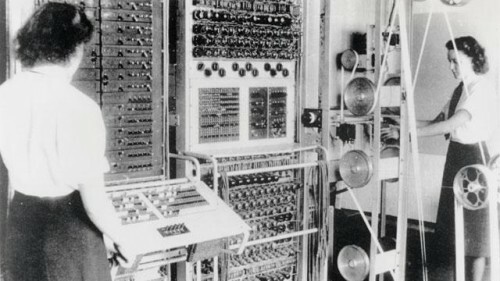 80% of Bletchley Park was female, and these are just two stories I dug up with light googling. Just think what else we could dig up if we put our internets together! Above all, we have to keep finding and repeating these stories as often as we can. With regard to female achievements in science and engineering, absence of evidence is often taken as evidence of absence. This doc shows that model of thinking to be wrong. Brilliant work is often lost to history, especially if the work is done by people from whom brilliance is not expected. We must seek out these stories (and trumpet them!) or risk feeding that same expectation that we’ve done nothing.